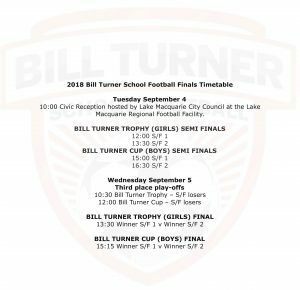 Bill Turner School Football Incorporated will this year conduct the 40th Bill Turner Cup at Northern NSW Football’s home – Lake Macquarie Regional Football Facility, Speers Point in September. The high school knock-out competition, for boys 15-years-and-under, was first contested in 1979 in the football state of Northern NSW at Wallsend’s Crystal Palace. Lake Macquarie, NSW High Schools Belmont and Whitebridge met in that final with Belmont 1-0 winners of the inaugural Bill Turner Cup. The winning goal, from the penalty spot, was scored by Murray Weaver (deceased). Team members of the 1979 Belmont and Whitebridge High School Teams are invited to attend the Bill Turner School Football Finals Series. Bill Turner OA was a music teacher at then Booragul High School, now know as Lake Macquarie High, and was one of several teachers from the Lake Macquarie and Newcastle region who had the foresight to start a competition for the 15-years-and-under students. 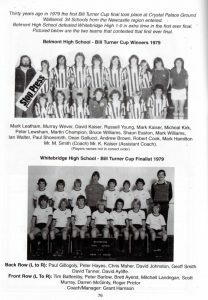 The original committee, Northern NSW Schools Soccer, and chaired by Bill took an interesting twist when he was not invited to a special meeting where the committee resolved to name the Cup after him. Bill’s son, Lloyd Turner – now a prominent member of the Executive Committee – remembers this time well. “Soon after the ‘special and secret’ meeting the committee came to Bill and informed him of their decision to name the competition in his honour,” Lloyd recalled. “Bill objected, like they knew he would, but the committee were one step ahead with the constitutional change. Northern NSW Football immediately endorsed the concept, which commenced with a modest 34 entries from the state and private schools in the Newcastle and Lake Macquarie region. Bill Turner passed away, aged 83-years, in February 2013. Bill Turner was a lot more than a football man, he was a family man who immersed himself in music, the church, table tennis and wrestling to name a few of his interests, or in most cases his passions. On one occasion his commitment to the church saw him reject an appointment to referee the visiting Manchester United FC side. 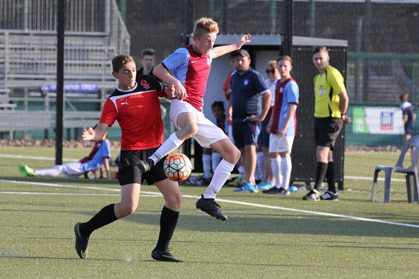 Over the years the Bill Turner Cup has evolved to the point where the competition is held in high regard in the Football community and is recognised as one of the largest sport’s team competitions in the world. This year the Bill Turner Cup and the Bill Turner Trophy for girls, has 850 school teams from the Football States of Queensland, Northern NSW, NSW, ACT and Victoria participating with 450 boys and 400 girls teams entered. The competition is closing in on the summit for 2018 where the four Cup and four Trophy teams left standing will contest the 40th Bill Turner Cup, for boys and 28th Bill Turner Trophy, for girls on September 4 and 5 at the Lake Macquarie Regional Football Facility, Speers Point, NSW.